We are delighted to welcome Lady Maisery as our 2017 Artists in Residence. Over their year with us they will be featuring as tutors on a number of courses in addition to leading two singing weekends. Subject to funding they will also be developing some new work during their time with us. Please check this page for further details. 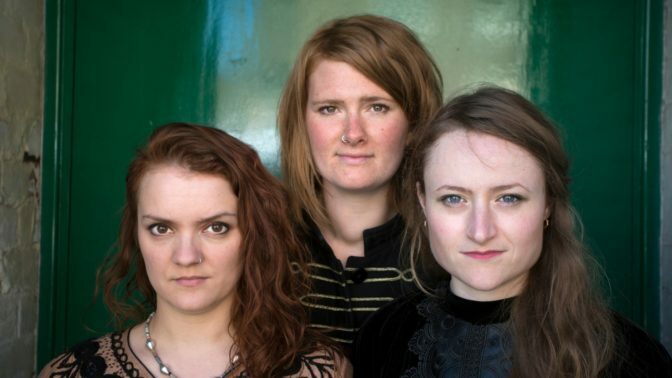 In an English folk scene currently bursting with bold and innovative folk music, vocal trio Lady Maisery shine brightly. With their unique approach to harmony singing, intelligent and thoughtful arrangements of both traditional repertoire and original compositions, Hazel Askew, Hannah James and Rowan Rheingans harness and celebrate their united voice. Whether unearthing a feminist twist hidden in a traditional tale, delivering a poignant anti-war ballad, or showcasing their immense multi-instrumental talents in original compositions that draw on a myriad of musical influences, Lady Maisery are skillful explorers of the power, beauty and vitality of song.